I'm working in a human genetics laboratory and currently a section of our lab space is being cleared and cleaned for new people. They're relocating and giving away a lot of various small lab things and I spotted these cute tiny glass vials that were possibly on their way to the trash bin. I immediately figured they might make perfect pollen collection tubes and asked if I could take them. 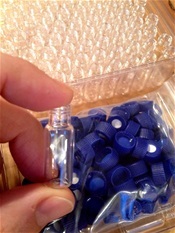 I normally use cheap 1.5 or 2.0 ml semitransparent plastic tubes for pollen collection and storage, both rose and rhododendron pollen as well occasionally some other pollen. I will have to test if these glass vials will work equally well. At least their transparency may make it easier to see small amounts of pollen.